John Cyrus McIntire, Lieutenant Commander, born April 23, 1914, Crawfordsville, IN. He enlisted in the USN at Indianapolis, IN, April 7, 1934; was sent to NTC Norfolk, VA; was assigned to the USS Lexington (CV-2) in August 1934; and was assigned to the USS West Virginia in February 1935 at Bremerton, WA. On Dec. 7, 1941, there was an early order for Fire and Rescue Quarters, then GQ sounded causing much confusion, followed by tremendous noise of exploding bombs and torpedoes. All of his gun crew was mustered. Upon departing the ship, a group of sailors was taken to Ford Island Armory to draw rifles and side arms. While there, an officer from the West Virginia asked for volunteers to return to the ship to fight fires and they fought the fires until about 1600 hours on Monday, December 8. He was then assigned to the Pearl Harbor Receiving Station as Master at Arms. In May 1942, he was reassigned to the West Virginia as part of the salvage crew. He made chief in September 1942 and was assigned to the West Coast for new ship construction. He was assigned to the USS Frankford (DD-497) in September 1942; the ship was commissioned in April 1943; and McIntire was commissioned ensign in October 1943. He participated in D-Day invasion at Omaha Beach as first lieutenant and damage control officer during the Frankford's tide-turning fire cover of the troops on the beach where Army artillery had been lost. After WWII he stayed in the USN and was commanding officer of three ships, the last being the USS Safeguard (ARS-25). His last assignment prior to retirement was to the Armed Forces Police Detachment, San Francisco. 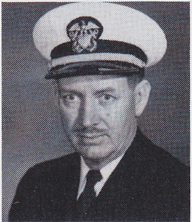 McIntire served in the USN until his retirement in 1964 at which time his rank was lieutenant commander. In civilian life, he was involved in the catering business, and has served 27 years as a charter staff member/instructor at the Fruitvale Presbyterian Church Senior Activities Center. He is also a member of the Retired Senior Volunteerr Program of Oakland, CA. He lives in Oakland, CA with his wife, Isabella.